Just because we voted an orange, fluffy Demogorgon into office doesn’t mean Election Day was a total bust: California, Maine, Massachusetts, and Nevada legalized laws in support of recreational marijuana. Meanwhile, Colorado’s been buzzing since they legalized it in 2014, and, believe it or not, they haven’t just been chilling in a cloud of smoke this whole time. Faced with the reality that tourists and locals had nowhere to toke up outside of local residences, Denver officials proposed Initiative 300, which, according to the Denver Post, “would create a four-year pilot program allowing regular businesses, such as bars or cafes or even yoga studios, to seek permits for bring-your-own marijuana.” This seems like a logical alternative to the state’s few cannabis clubs, which have already run into trouble with local government. 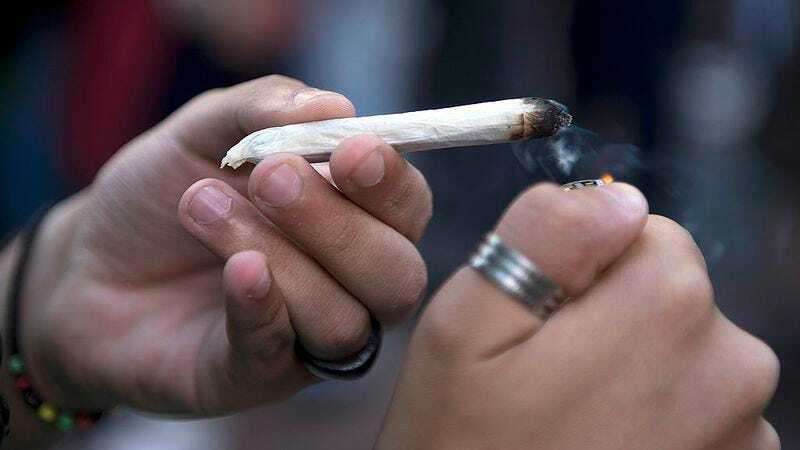 Initiative 300 was officially passed on Tuesday, making it the first city in the U.S. to allow pot in restaurants and bars. But while the measure takes effect immediately, it’s likely to be a while before you can enjoy that public puff-puff-pass. First, participating businesses need to get support from a city-registered neighborhood organization or Business Improvement District, which may prove to be tough considering the initiative’s vocal opposition and tight results. Other caveats limit smoking to designated outdoor locations, though patrons are allowed to vape or ingest edibles, like brownies, indoors. And since state law still bans the sale of pot and food or drink at a single location, you won’t be able to order an ounce with your Budweiser at the bar. Emmett Reistroffer, the initiative’s campaign manager, calls it “the sensible thing to do.” Opponent Rachel O’Bryan, however, asks how “these businesses possibly monitor patrons for marijuana intoxication?” Easy, kick out anyone who puts Phish on the jukebox. Or just give ’em some B12 and orange slices.